When I think about that first pizza I tried I would be disgusted if you gave me one now. I won’t name the brand but fake tasting tomato sauce and some poor excuse for cheese, I’m glad both the pizza and I have moved on. We have also moved on in terms of the pizza itself. We realise it doesn’t have to contain a tomato base** and the whole of the food spectrum is your oyster. Apparently you can get a chocolate pizza from our local kebab shop! 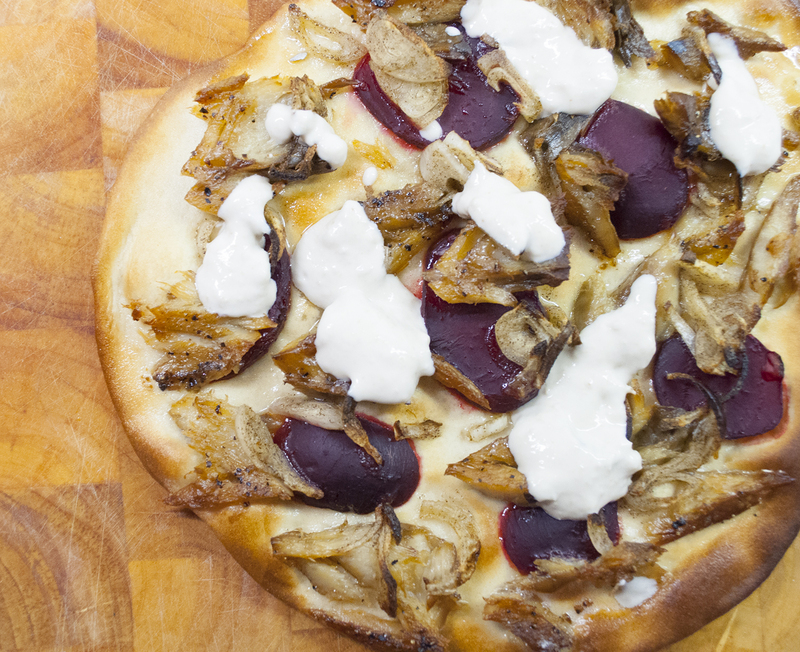 So don’t read on if a smoked mackerel and beetroot pizza isn’t for you. Next month it’s a sprout and blue cheese one which brought gasps of disgust when I mentioned it at work. Heathens! I’ve gone back to Hugh Fearnley-Whittingstall’s Three Good Things for this one. Stick a baking tray in the oven. Toss the shallots in the oil and season well. Mix the horseradish with the yoghurt and a squeeze of lemon. Season. Roll out the dough to your preferred pizza sizes. Make them as thin as possible. At this point I always transfer mine to the heated tray and build the pizza. Distribute the mackerel, shallots and beetroot over the pizza(s). Pop in the oven and cook for around 10 minutes. Pop the sauce over the cooked pizza and enjoy. ** according to Collins the definition is ‘a dish of Italian origin consisting of a baked disc of dough covered with cheese and tomatoes’. I would love this but my kids would officially kill me. We have pizza and smoked mackerel fairly regularly. They love one and hate the other. I’m sure you can guess which! Oh dear. To be honest I hated the smell when I was young(er)! Wow, might have to try this out sometime outside of my pizza restaurant. Looks great!